Tash-Kalar is the ancient art of magical combat performed in arenas and combat pits throughout the known world. Tash-Kalar is also the name of the oldest and most famous arena, the place where the game began. You can play the game with 2, 3, or 4 players, in teams or individually. Whether you are playing the High Form or a deathmatch, all games of Tash-Kalar have the same basic rules : ... <lire la suite>. Tash-Kalar is the ancient art of magical combat performed in arenas and combat pits throughout the known world. Tash-Kalar is also the name of the oldest and most famous arena, the place where the game began. You can play the game with 2, 3, or 4 players, in teams or individually. Whether you are playing the High Form or a deathmatch, all games of Tash-Kalar have the same basic rules : Players take turns creating magical stones and placing them in patterns that allow them to summon fantastical beings. Here you will find the mystical intrigues of the Sylvan, the brutal fury of the Highlanders, and the incisive tactics of the Imperials. Your beings can move around the arena, disrupt opponents’ patterns, and form new patterns that allow you to summon more beings. Each form of Tash-Kalar has its own means of scoring and deciding on a victor. 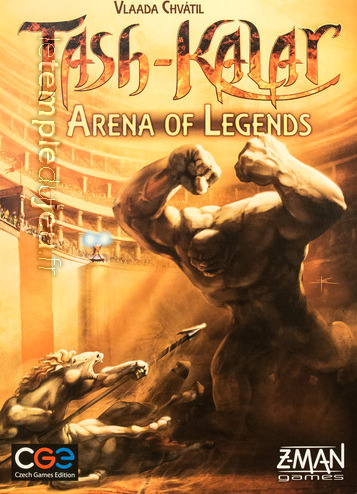 Lay your plans, strengthen your position, then unleash your full power as you summon a tremendous creature of legend to dominate the arena of Tash-Kalar.